Plant Notes: Nearly all the specimens identified as A. arctatus in upland areas of the peninsula are now considered the Florida endemic A. cumulicola (Bridges & Orzell 2018). 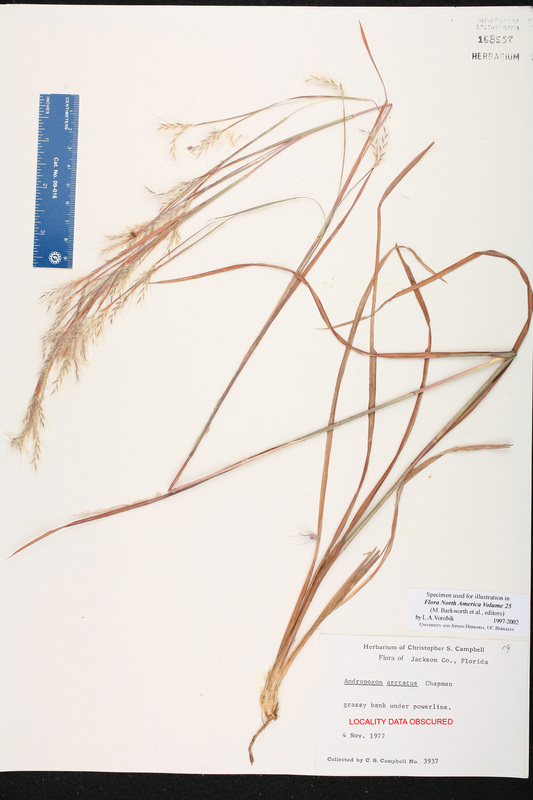 Citation ANDROPOGON ARCTATUS Chapman, Bot. Gaz. 3: 20. 1878. 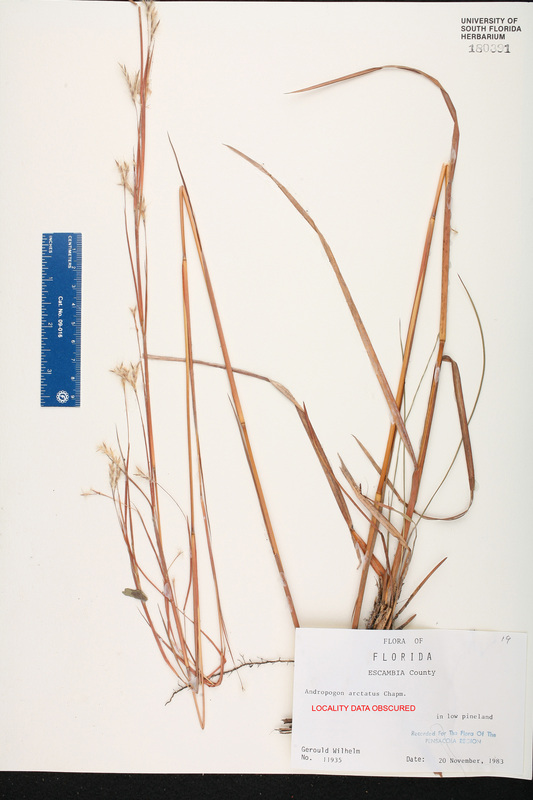 Basionym: Andropogon tetrastachyus Elliott, var. distachyus Chapman 1860. 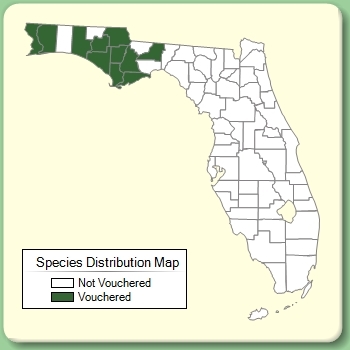 Type: FLORIDA: Franklin Co.: Apalachicola, s.d., Chapman s.n. (lectotype: NY). Lectotypified by C. S. Campbell, J. Arnold Arbor. 64: 207. 1983. Clay US-Lit Lit-US: C. S. Campbell, J. Arnold Arbor. 64: 207, 209. 1983. Gulf TAES-Lit Lit-TAES: C. S. Campbell, J. Arnold Arbor. 64: 207, 209. 1983. Santa Rosa US-Lit Lit-US: C. S. Campbell, J. Arnold Arbor. 64: 207, 209. 1983. Washington US-Lit Lit-US: C. S. Campbell, J. Arnold Arbor. 64: 207, 209. 1983. 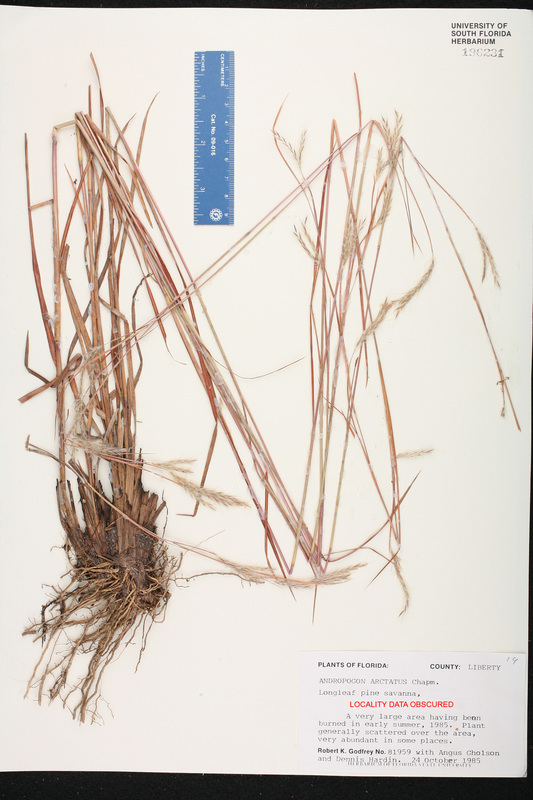 Andropogon tetrastachyus var. distachyus Andropogon tetrastachyus Elliott, var. distachyus Chapman, Fl. South. U.S. 581. 1860. TYPE: FLORIDA: Franklin Co.: Apalachicola, s.d., Chapman s.n. (lectotype: NY). Lectotypified by C. S. Campbell, J. Arnold Arbor. 64: 207. 1983. Leptopogon carinatus subvar. arctatus Leptopogon carinatus (Nees von Esenbeck) Roberty, subvar. arctatus (Chapman) Roberty, Boissiera 9: 197. 1960. 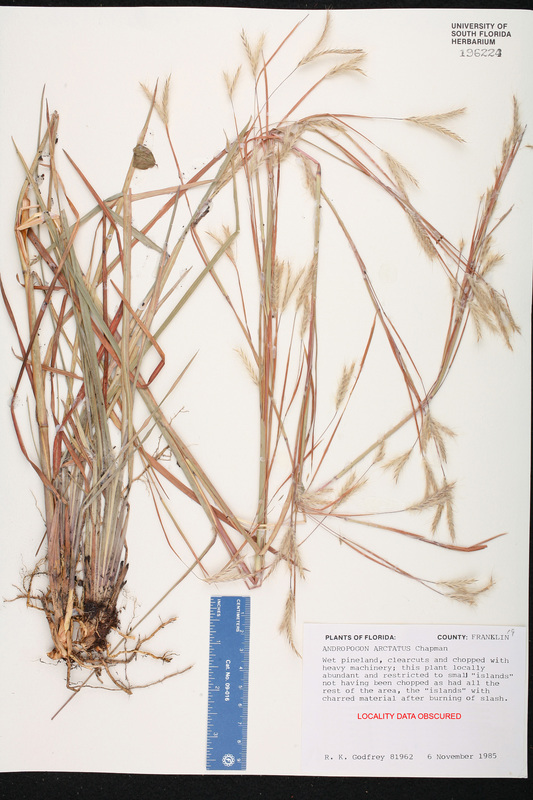 BASIONYM: Andropogon arctatus Chapman 1878; Andropogon tetrastachyus Elliott, var. distachyus Chapman 1860. Sorghum arctatum Sorghum arctatum (Chapman) Kuntze, Revis. Gen. Pl. 2: 791. 1891. BASIONYM: Andropogon arctatus Chapman 1878; Andropogon tetrastachyus Elliott, var. distachyus Chapman 1860.